Just as farmers take care of the crops they grow, it is just as important to care for and maintain a healthy lawn at your home. Why?!?!? Fertilizing and overseeding your lawn can help to create a healthier environment for your family and pets, by assisting in preventing intruding weeds. natural air conditioner - 8 average sized lawns have enough cooling effect for 16 average sized homes. helps to control soil erosion, protect surface water quality and acts as a filter for the air we breathe. A healthy 50 x 50 foot lawn generates enough oxygen for a family of four to breathe for one year. Following Dr. 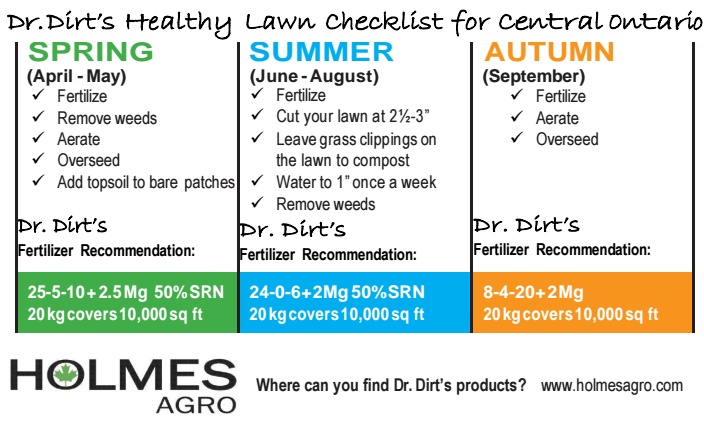 Dirt's healthy lawn checklist can help you to create a healthy environment for your family. Where can you find Dr. Dirt's products?? ?